Enriching Lives through Music inspires youth from underserved neighborhoods to envision and achieve success in all facets of their lives through music education, performance, and engagement in a vibrant center of musical excellence. Enriching Lives through Music sparks passion and community engagement through a deep connection to music. 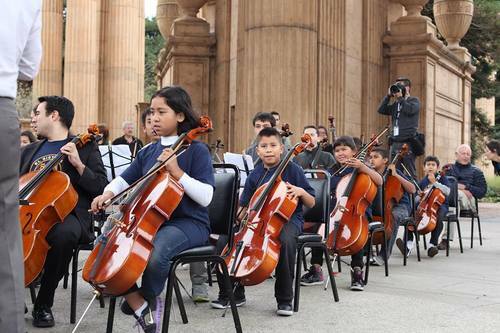 ELM enriches the lives of over 120 students from the largely Latino immigrant Canal neighborhood of San Rafael, California through free and intensive music programs. Our students work with top-notch teachers, mentors, and musicians to progress from a tune on the recorder to a symphony, salsa or samba on a classical instrument. ELM inspires youth from underserved neighborhoods to envision and achieve success in all facets of their lives through music education, performance, and engagement in a vibrant center of musical excellence. We invite you to share the joy, hard work, and wonder of seeding and nurturing a lifelong love of music.